Plot Summary: This visual production is a project of Hachinohe Portal Museum “hacchi”, a cultural facility located in Hachinohe, Aomori Prefecture. 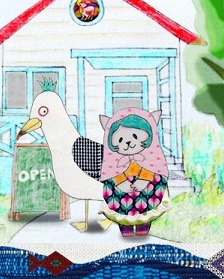 The animation, set in the coastal area of Hachinohe depicting the landscape and life in Hachinohe, from the eyes of a girl called Hamaneko who came from the planet Nekoryoshka, and Kabu a black tail gull; employing animations created from textiles. Food menu that appears in the story are original productions of [Bistrot Pot d’Etain] chef , Yuki Miura, of Hachinohe.